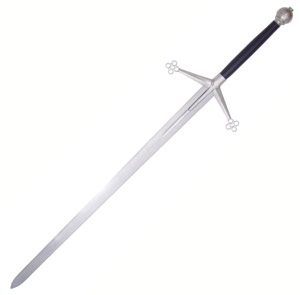 The term claymore (pronounced /ˈkleɪmɔər/, from Scottish Gaelic claidheamh mòr, "very big sword" may refer to one of two distinct types of Scottish swords: it may refer to a two-handed sword with a cross hilt, of which the guards were usually turned down, used by the Highlanders of Scotland; or to a basket-hilted broadsword adopted in the 16th century, which is still worn as the full dress sword in the Highland regiments of the British Army. Line art drawing of a claymore.The two-handed claymore was a large sword used in the late Medieval and early modern periods. It was used in the constant clan warfare and border fights with the English from circa 1500 to 1700. The last known battle in which it is considered to have been used in a significant number was the Battle of Killiecrankie in 1689. It was somewhat smaller than other two-handed swords of the era. The two-handed claymore seems to be an offshoot of Early Scottish medieval swords which had developed a distinctive style of a cross-hilt with downsloping arms that ended in spatulate swellings. The spatulate swellings were frequently made in a quatrefoil design. The average claymore ran about 140 cm (55") in overall length, with a 13" (33 cm) grip, 42" (107 cm) blade, and a weight of approximately 5.5 lb (2.5 kg). The blades are most similar to the type XIIIa, using the Oakeshott typology. Fairly uniform in style, the sword was set with a wheel pommel often capped by a crescent-shaped nut and a guard with straight, down-sloping arms ending in quatrefoils and langets running down the center of the blade from the guard. Another common style of two-handed claymore (though lesser known today) was the "clamshell hilted" claymore. It had a crossguard that consisted of two downward-curving arms and two large, round, concave plates that protected the foregrip. It was so named because the round guards resembled an open clam. Scottish broadsword, c. 1700The later weapon was a much shorter, one-handed sword popular with Scottish troops and some English officers from the 17th century onwards, even seeing limited combat during World War II; a modern "claymore" was carried in World War II by Lt. Col. Jack Churchill DSO, MC & BAR. It could be either single- or double-edged, typically weighed between 2 and 3 lbs (0.9 and 1.5 kg), with a fairly wide blade typically 30 to 35 inches (0.75–0.9 m) long. The basket hilt was designed to protect the hand in combat. The Scottish basket-hilt sword is often distinguished from others by the velvet liner inside the basket (often in red), and also sometimes by additional decorative tassels on the hilt or pommel. Like its Italian counterpart, the Schiavona, it was normally used with a round shield, known as a targe. This latter form of "claymore" (unrelated to the first) can be seen in some forms of what is now considered highland traditional dance (which correspondingly stems from the Victorian era romanticism of the Highlands of Scotland). The basket-hilted Claymore is still carried by officers in the Royal Regiment of Scotland as part of ceremonial dress, in contrast to the rest of the infantry's officers, who carry the 1897 Pattern or Gothic hilted swords. The term "claymore" was used from at least the beginning of the 18th century to refer to the basket-hilted one-handed sword, more or less synonymously with "broadsword". From at least the later 18th century, it could also be applied to the two-hander. The contemporary Gaelic term for the two-hander is unknown; it may or may not have been called a claymore at the time of use. In modern usage the term is correct for both weapons. The Gaelic for "two-handed sword" is "claidheamh dà làimh", and in modern terminology is sometimes applied to the Scottish two-hander to distinguish it from the one-handed claymore.